Another day with an itinerary planned. Since we are in the Cognac region we felt it would be rude to ignore such a significant subject. So our task for the day was to visit the significant towns of the region, Cognac, Jarnac, Segonzac, Chateauneuf sur Charente & Rouillac. So off we set, sun shining, for Cognac. However, our entry to the town was a little hectic. Noisy roads and difficulty finding a route to the historic areas had soured our moods a bit so we decided not to stay. You know what it is like when you don’t like the feel of a place. Can’t put your finger on quite what it is but you know you can’t stay. Perhaps if we had entered on a quieter road we would have stayed. 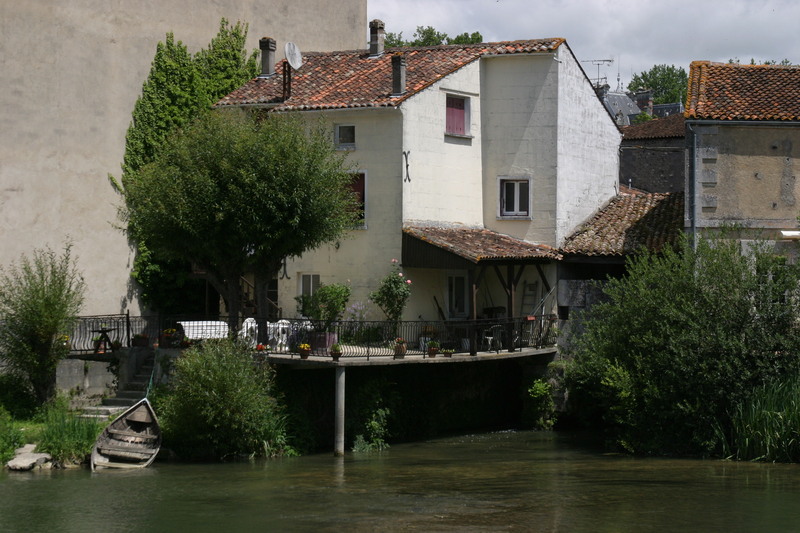 I know that we are doing Cognac a huge disservice and have probably missed a huge amount, which is why it has not been struck of our list of places to visit. Just not on this trip. 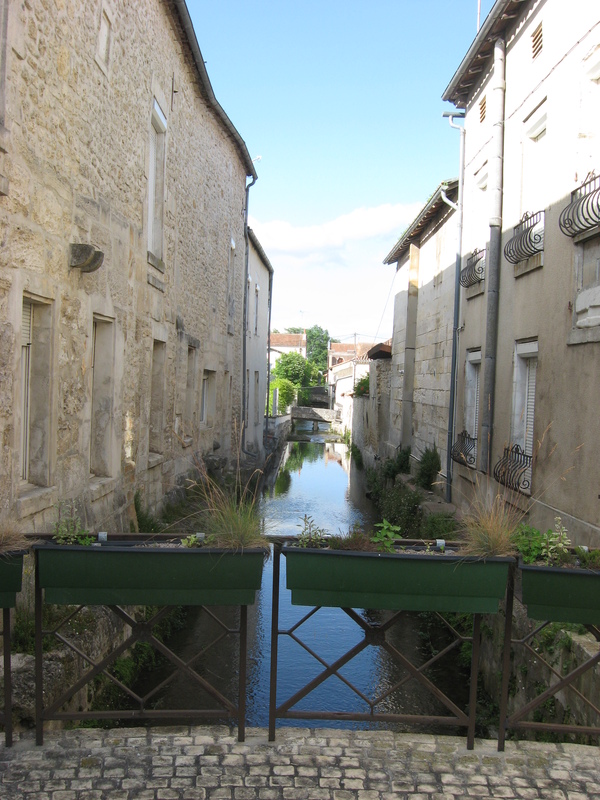 So we headed out to the next place itemised on our personal itinerary, Jarnac. 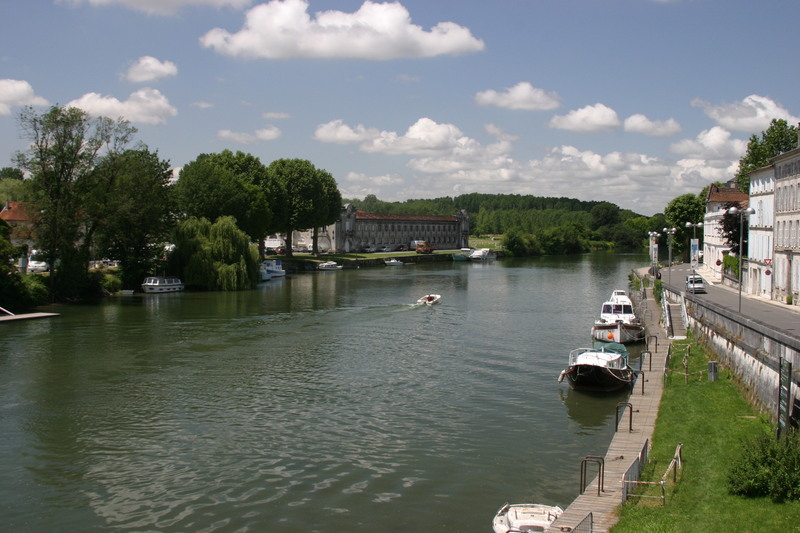 The feel and pace of Jarnac is entirely different and we rapidly found a place to park, free, on the Quai Orangerie, near the Hine buildings. As it happens we were also very close to the Courvoisier buildings too. Jarnac is equally proud to be the birthplace of François Mitterrand, one of France’s more recent presidents. 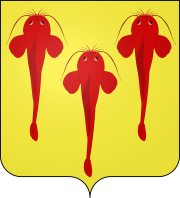 We walked alongside the river, past the boats moored with myriads of fish darting around just below the surface. 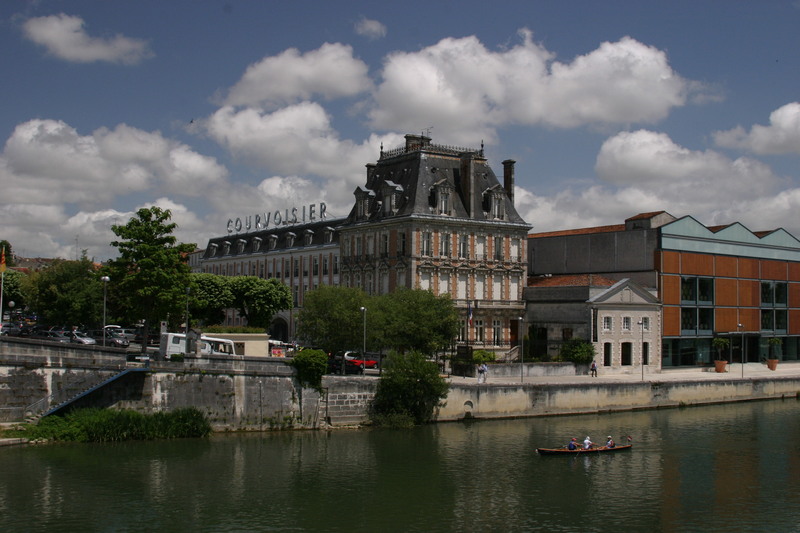 We crossed the road towards the Courvoisier building before crossing the bridge and heading further along the river to a park. Given the days temperature it was nice to get under the shade of the trees. A group of school children were enjoying some team sports while on the grass, while over in river shallows a group of lads were lobbing a ball around. They were joined by a lady and her dog who was soon lunging after the ball. A little further down on a small island two lads were fishing although I don’t think they really expected to catch anything with all the thrashing around in the water. 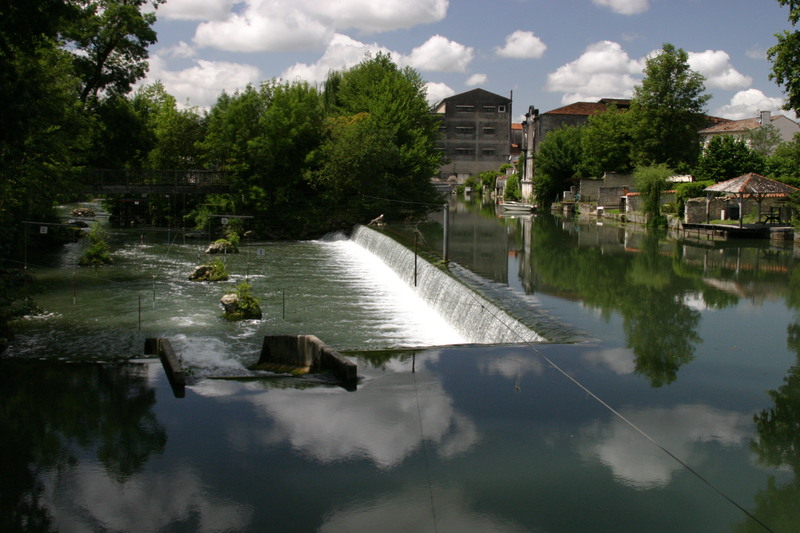 Alongside the park there are weirs and channels set up for kayak slalom racing. 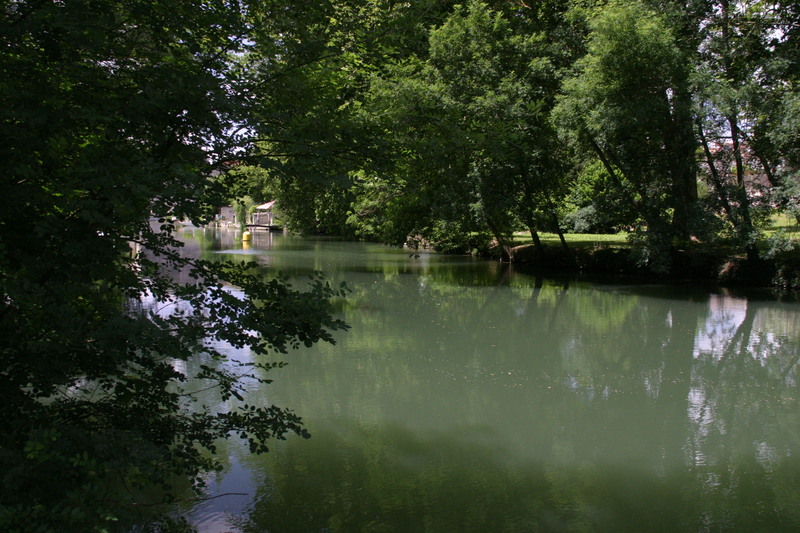 The park itself is on an island and the paths around its perimeter give one a direct view into to some lovely gardens some of which have their own moorings or pergolas and barbecues. 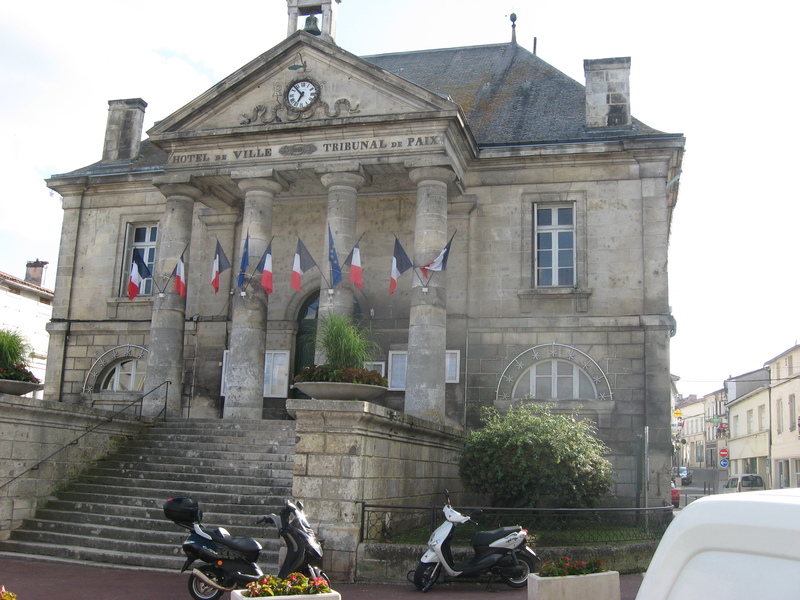 After a delightful time in the park we headed back into Jarnac to get ourselves a drink. We sat and people watched while we had a couple of beers and nibbles at L’Alambic, Place Du Chateau. It was quite entertaining as opposite the bar there is a small car park with a Tabac off to one side. The comings and goings, the double and sometimes treble parking was exposing the dark side of some of the drivers who were dashing into the Tabac, we presumed, to get their lottery tickets. 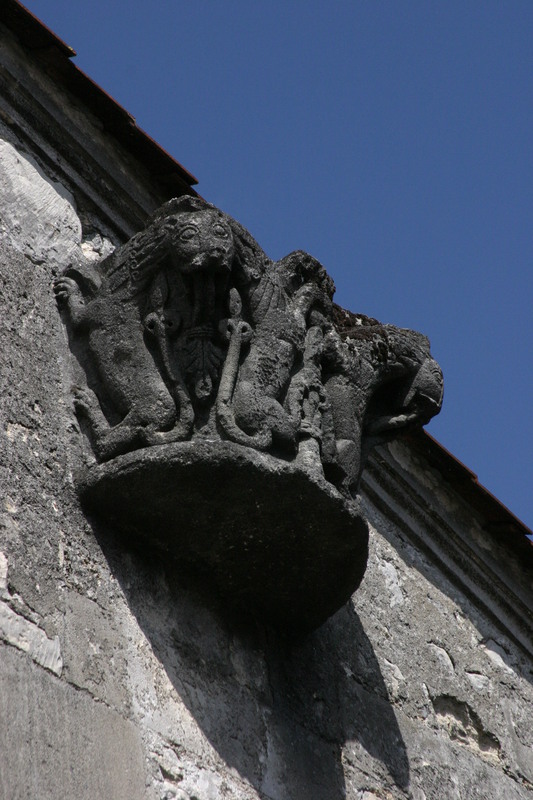 After, we meandered through the streets window shopping, and made our way back to the car, passing the church and numerous architectural features some of which I have attached below…..
Once back at the car we rested in the shade and topped up with water. This was one of the hottest days of our holiday so far. Given the time, nearly 17:00, we had to replan our itinerary. Obviously we were not going to be able to visit and tour all the places on our list. So we decided to move on to Segonzac with a view to seeing what we could and maybe getting a meal. Segonzac was only a short drive away and we were soon parked up a short way from the town square. We would have been parked closer but a stupid woman, stopped her car directly in front of me in the entrance to the car park. Got out of her car and crossed the street. Leaving her car blocking the entrance to the car park. The Hotel de Ville was very prettily decked out with many flower baskets. The church was huge but nice and cool inside giving us some respite from the heat and the brightness of the sun. 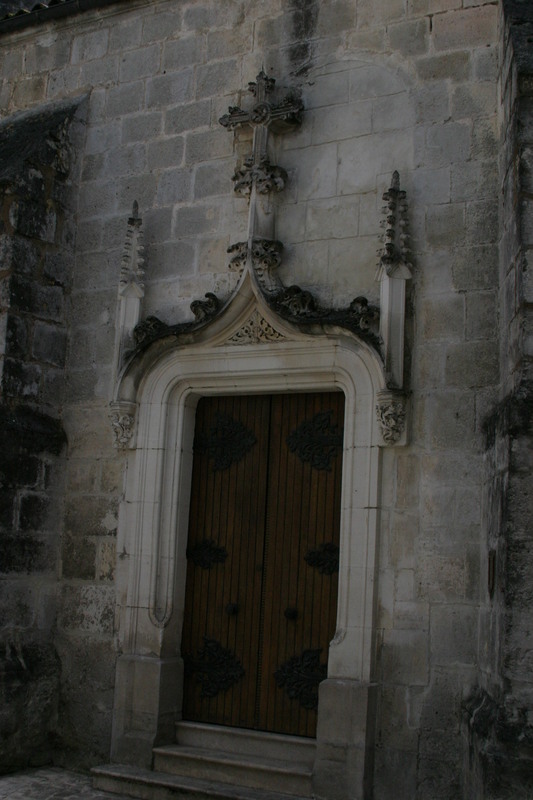 Church of Saint Pierre, Segonzac, Charente, France. Spire is made of stones in the form of pine cones. 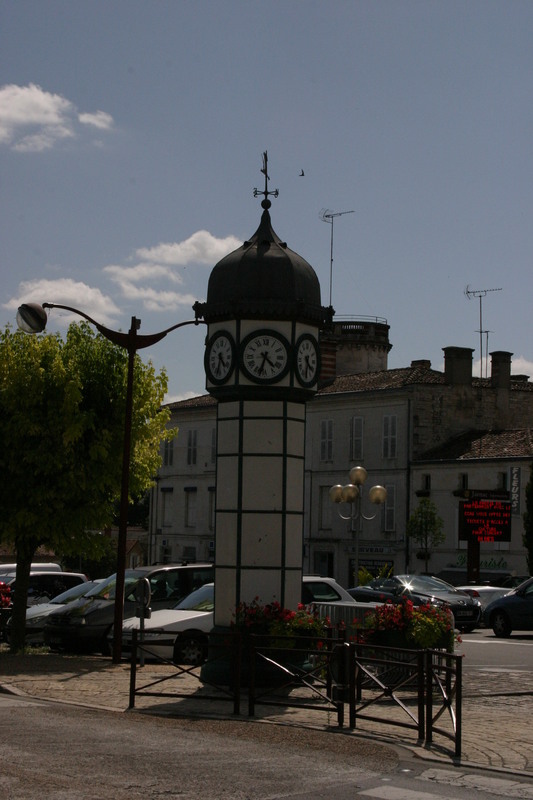 We were beginning to realise that we were still too early for a meal in a restaurant and nothing else being available we decided to head on to Chateauneuf-sur-Charente. Only a short journey and we were soon parked up and walking the streets hunting down a place to eat. Unfortunately the only places open were doing fast food. The evening menu still an hour or two off. So, we headed back to the car having decided to aim back to the gite going via Rouillac which was on our original list of places to visit. I had also spotted a couple of signs indicating the existence of restaurants on the road out of town. So we followed the signs and visited the restaurants…..you guessed it. Closed. 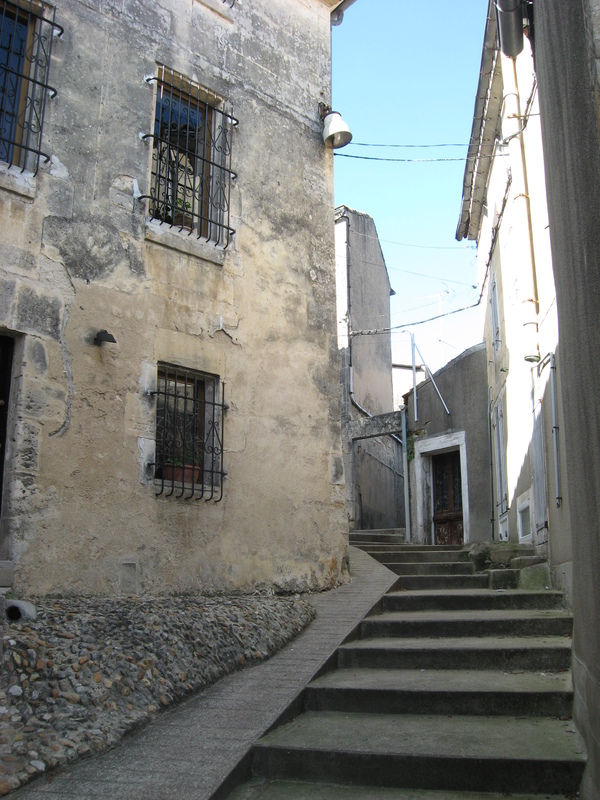 On to Rouillac and a quick motor round the streets which showed no sign of open eateries. We were getting concerned about the time. If we just headed home to the gite it would be too late to think about cooking. At our age late eating can play havoc with the digestive system and I wasn’t prepared to go without a proper meal. Snacks are OK but not really fulfilling. Then I had a brilliant idea. Why don’t we use the SatNav to identify restaurants in the area. Sure enough it started to identify the ones that we had already visited and determined that they were closed. So we decided to hedge our bets a bit. So we asked TomTom to find us the nearest Buffalo Grill. 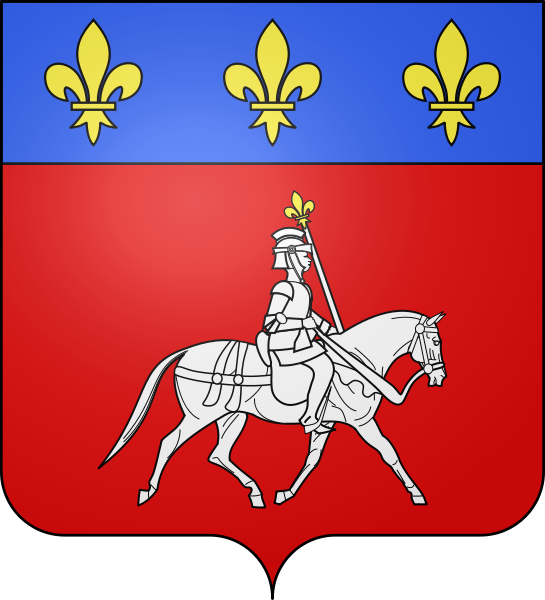 It did what it was asked and we duly plumbed in the route and set off to the restaurant which was located in Chateaubernard just two miles from Cognac. 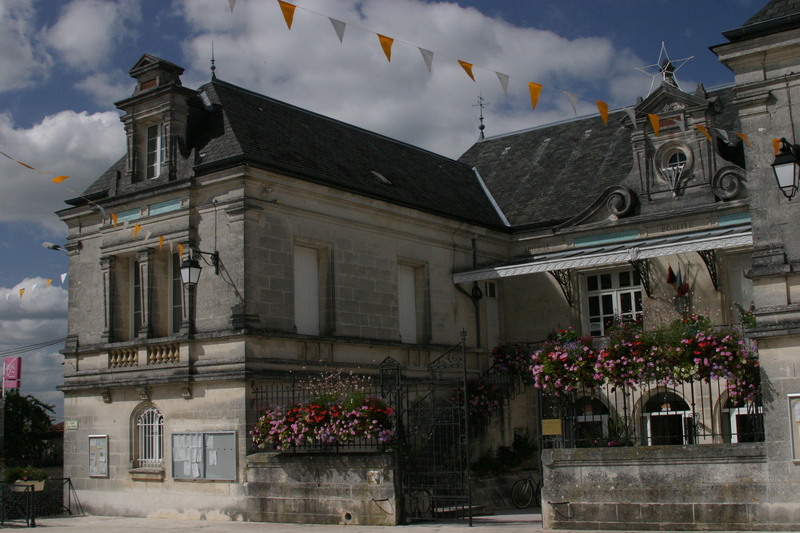 We had in fact passed through Chateaubernard on our way to Jarnac after we had jettisoned Cognac earlier in the day. Well what the hey. We sat outside on the deck and had a nice meal courtesy of Buffalo Grill. I had a burger, medium rare, and my wife had a Rump Steak also medium rare. Very well presented and filling. So we had circled Cognac and what seemed like most of the towns in the Cognac region. We had a great day even though it looked like France was determined to starve us out. The gite was finally illuminated in our headlights around 22:30 after a lonely drive through the French countryside. I nearly squashed the lettuce, gifted by Didier, left by our front door some time earlier in the day. Of course I had to wash that straight away since we didn’t know what creepy crawlies had decided it was their birthday. We added it to the two other lettuces we had in the fridge, also courtesy of Didier. So a cup of tea while we gentle ceased circling and thence to bed. 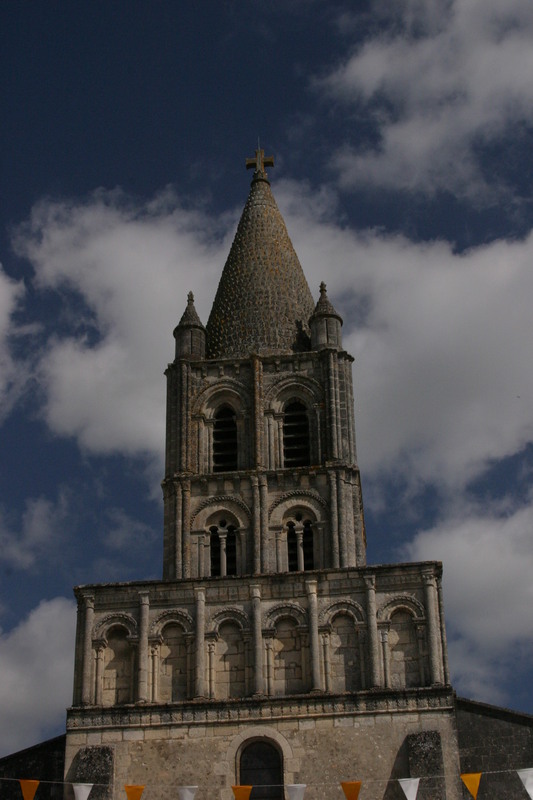 This entry was posted in Travel and tagged Charente, charente france, Chateauneuf-sur-Charente, Chez Allard, Church of Saint Pierre, cognac region, Courvoisier, France, Hine, Hotel de Ville, Jarnac, personal itinerary, pine cones, Quai Orangerie, Segonzac, travel, vacation, viewing point. Bookmark the permalink. ← Independence Day – Enjoy !! !